Ruth Adel Olsen. My mother-in-law, pictured above, long before I knew her. Her smile belies the hard times she'd endured growing up on a remote farm in the north. A father who suffered from mental illness. A tragic house fire where her efforts to save a little step-brother resulted in severe burns and the death of the little boy. Her older brother died later in a gruesome sawmill accident. Several years ago, during a family get together in Jasper, Mum told us of the long journeys she made by train from Newlands, BC to Calgary, AB for her nurse's training. The old train station in Jasper is still in operation at the time of our visit. We wandered through it while Mum recalled long hours spent on the hard benches waiting for a connection, and told stories of other passengers she had met. The train passed within a kilometre of her home in Newlands, so the train engineer would stop there and let her off in the middle of the night. Her step-father met her with a lantern and together they trod across the road and up the long drive to the farmhouse. She met her husband, Ron, while on a blind date with his brother, at a park in Calgary. Ron saw her from the other side of the river, swam across, and introduced himself. Ruth said that she thought Ron much more handsome than his brother. They married soon after her graduation. Four children were born. Ron had itchy feet and the family moved frequently. Ruth made a home wherever she found herself - USA, Chile, Namibia, Mexico, Guatemala, and numerous places in Canada. After Ron passed away 18 years ago, she moved back to Alberta, to be near family. I learned much from my mother-in-law: how to pack boxes and crates for overseas moves, how to make Yorkshire Pudding, a great pastry recipe, the importance of not complaining when life doesn't go my way, and so, so much more. She used more black pepper than anyone I've ever known and she was generous with her time and resources. She set out to make friends wherever she was, although in her later years, because of hearing and sight loss, she kept more and more to herself. However, she was always happy to chat on the phone or visit in person when we were there. We did learn not to call on Sunday evenings when Downton Abbey was on for she was quite enthralled with the first few seasons. The first summer we were married, she brought over this Pinwheel crystal brandy snifter containing a rose from her garden. Just because. She was like that. If she saw something she thought someone else would enjoy, she shared it. Of course the best gift she gave me was raising her son, my Tim, to be the wonderful man he is today. I'm so thankful for his love and steadiness, his dry sense of humour much like his mother's, and so much more. One of the last photos of Mum, taken in March of this year, at her daughter's wedding. She was so glad to be there. Family was so important to her. And faith. She loved us all well and prayed for each one of her children, grandchildren and great-grandchildren. She would have been 87 tomorrow; she passed away just three months ago come Sunday. We miss her. Happy Heavenly Birthday, Mum. What a lovely picture, in words and photos ,of a much loved lady. Hugs and Love, a wonderful tribute to a wonderful lady. They (whoever they are) say that a man often chooses a wife who looks a great deal like his mother. If I didn't know better, a case could be made for that here, especially in her younger years. What a life she lived; sorrows and joys all mingled together. Wonderful to think of her perfectly well and happy enjoying her new life in Glory, though she is missed by her family and friends. I, like Vee, thought at first her nursing photo was you, but of course I realized it couldn't be. You've given us a glimpse into an amazing life. It's always interesting to learn the stories of people--hardships, joys, things they've done … so much to learn from others! A wonderful tribute Lorrie. It is so nice to have such wonderful memories and to share some of them with us. I too was blessed with a wonderful Mother-in-law who we miss terribly. Such a loving and beautiful tribute to a remarkable woman! How wonderful that she was able to be with family in her later years. Moving takes its toll on you... she certainly lived in some unique places! How wonderful that your husband Tim carries on her legacy with her wit, wisdom and spirit. 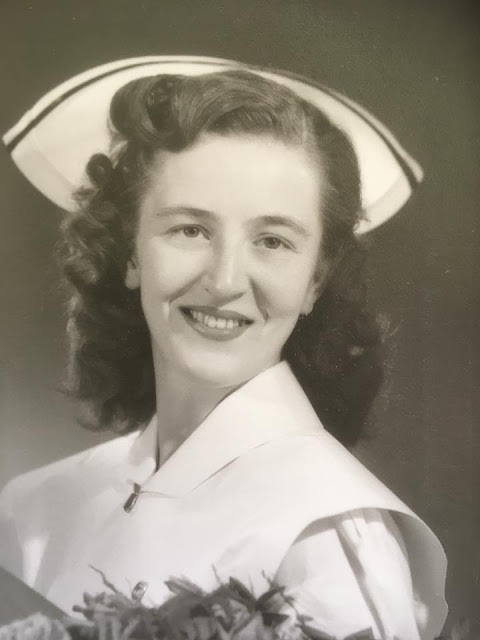 Beautiful picture of her as a nurse and later in life at the wedding, a remarkable lady. May the Lord bless your heart with sweet memories of her life. Hugs! What a beautiful tribute for a beautiful woman. What an amazing life she lived. Thank you for sharing her with us! Oh, this is precious. A lovely tribute for your dear mom-in-love. Lorrie, I'm so sorry for your, and your husband's, loss. What a beautiful tribute to her. My dear MIL died 10 years ago, and I still miss her every day. What a lovely tribute to your mother-in-law. Your words describing her life touched my heart. Such a heart warming post about a remarkable lady, Lorrie! She touched so many lives in so many ways, including those of us through the internet that have had the pleasure of learning from you & your wonderful Tim. I know she is missed but I bet she is smiling down upon all her family from her Heavenly cloud. Such sad times but such sweet memories. Thanks for sharing this Lorrie. Beautiful remembrance. Lorrie, thank you for sharing a little of the story of this amazing woman! Isn't that nursing graduation picture lovely and her uniform so perfectly crisp and white? Not many women can say their future husbands swam a river to meet them. You must share more stories of her life in the faraway countries. And I don't blame her for wanting to reschedule Sunday night phone calls during Downton Abbey, I remember asking the same thing. Thank you for sharing these wonderful memories of your amazing mother-in-law. I especially enjoyed her "how we met" story and can totally relate to her appointment TV habits (the Crawleys and downstairs staff needed our full attention!). This made me just a bit teary... such a beatiful tribute to your mom-in-law. What a lovely tribute to your mother-in-law. All the good memories are now your treasure. Lovely tribute, Lorrie. What a blessing to have such a mother in law. Lovely story about a lovely lady - I'm so glad you had a good relationship with her like I did with my MIL. Mine was the daughter of a French Canadian mother from Sherbrooke, Quebec, and she grew up in New Hampshire. I learned some great recipes from her, we sewed clothes together, and she was always clipping articles for me to read to help me get used to American life. We enjoyed many happy times together when Bob and I married and moved to New Hampshire and lived near his parents. One hears such awful stories about bad MIL's - seems you and I were fortunate in that we had wonderful ones! I'm sorry for your loss, Lorrie. May your mother in law rest in peace. I so enjoyed reading your touching tribute to a wonderful woman, you were very lucky indeed to have her in your life. So nice to read your heartfelt, kind words about your mother-in-law, Lorrie. Her early life sounded so sad, yet it was inspiring to hear how she went on with a successful and fulfilling life. I think the story of her bringing you the rose in the brandy snifter is so sweet. It reminds me of something my mom would have done. A simple act that reminds us we are thought about and loved. I know this birthday without her must have been bittersweet for you and your family. My thoughts are with you. Mrs. Ruth is the epitome of a life well lived. What an inspiration to all on how to make the best of things. A truly moving profile Lorrie. This is just such a wonderful post. A strong woman. I think often how the world has begun to define a strong woman and the popular masses are wrong. Such a beautiful tribute indeed to her! What a lovely tribute, Lorrie! The ladies of yesterday could sure teach the young ones today some valuable lessons. Such a simple but thoughtful act of bringing you the rose in the pinwheel crystal was simply lovely! You are blessed to have had those lovely ladies in your life. Happy Autumn, my friend! 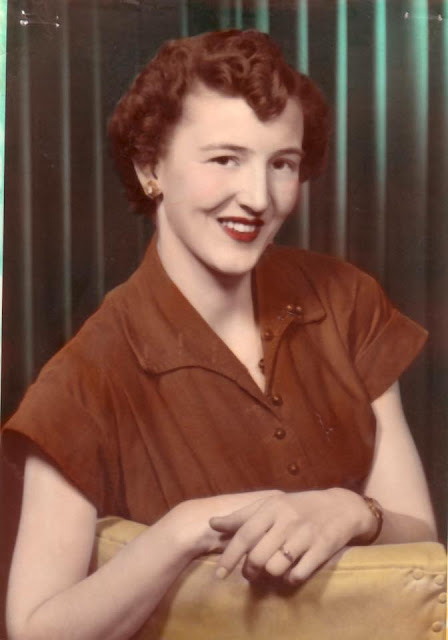 Oh my goodness, Lorrie, I can hardly write, as tears are streaming from my eyes after reading this lovely tribute to your late, and beloved mother-in-law. Yes, she gave the greatest gift of all, in raising your hubby, Tim. I once wrote those words to my late mother-in-law, to let her know that I appreciated her. Thank you for this most lovely story...it touched my heart this morning.